Kerisik is one of those ingredients that are native to the Malay Archipelago (Nusantara – Indonesia, Malaysia and Singapore). Its used in curry stews and rendangs. It’s very fragrant, and its best to use freshly grated coconut. But dried or desiccated coconut can be used too. It’s very easy to make, and a spoonful or 2 of kerisik in a dish makes all the difference. 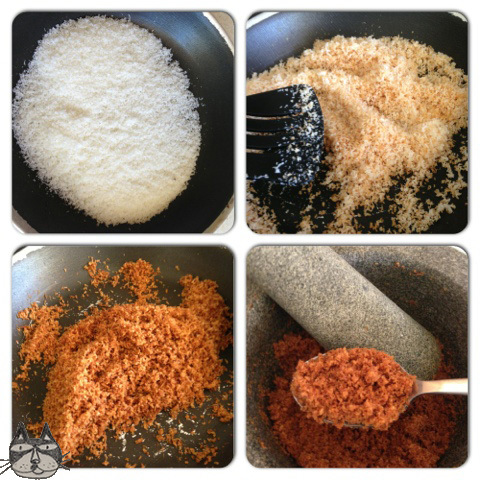 1 cup of coconut, grated. – fresh if you can find them, or use desiccated coconut like I do above with a sprinkling of water. In a dry pan, add the coconut. Turn on the heat on low, and slowly toast the coconut until it turns golden brown. Try not to burn it. You will start to smell the heavenly scent of coconut in your kitchen. Once brown, leave it to cool. In a lesung (pestle and mortar), pound the coconut into a paste to release the oils. You can also use a spice grinder to grind the coconut into a paste. It’s now ready to use.